The second volume of "European Company Law" series continues to discuss the Second Directive's fundamental institutions which are expected to be widely modified in accordance with the European Commission's directive entitled, "Action Plan to Move Forward". In this volume, the authors analyze and address issues concerning legal capital as a critical element of the current model of European shareholders' and creditors' protection. 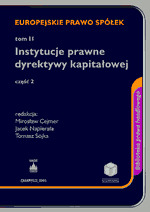 This book is designed to contribute to the growing debate about advantages and disadvantages of traditional institutions governing rules on public limited liability companies' capital formation and maintenance in the face of strong capital market pressure on European corporate structure. The EU Commission's proposal for amending the Second Directive provides evidence that the legal capital rules modernization process is becoming both increasingly visible and viable. Thus, the present development in legal capital rule is a natural prelude to the possible introduction of an alternative regime in the 3rd stage of the modernization program of European Company Law, that is scheduled for the time after 2008. Also, additional measures are taking shape—described in the 'Action Plan to Move Forward' as the Commission's recommendation concerning independent members of a supervisory board or remunerations of listed companies' directors. An analysis of the above-mentioned problems, commencing with the innovation of Corporate Governance, will be the key issues of next volume of "European Company Law." 2.1. "Rules of the game"
2. Contribution in kind regulation in the Second Company Law Directive- minimum or maximum standard?